What is your name and role within Concrete Surfers? Hey! I’m Jovi and I sing and play guitar. We are currently based in Brisbane and we wouldn’t wanna be anywhere else! Brisbane has such a close knit music community where it’s so easy to make friends and be around nice, likeminded people. We are pretty lucky in this little city that everyone in the music industry here is so supportive of each other and get really psyched when they sell out a show, or go on a big tour and it’s just really really nice. Back in high school Trent, Jamie and I used to play in another band just playing covers, but it didn’t really work out with our singer at the time so we parted ways but decided that we still wanted to play music together so the three of us formed as a 3-piece and I thought that I would just give singing a go haha. Now Sean is in the band too as a guitar player and it just feels nice and complete! We wouldn’t want to have it any other way. You’ve had a rad two years with shows playing bands like Good Doogs, White Blanks, Pist Idiots, Royal Blood, Ruby Fields, The Pretty Littles, how has your live show progressed since you started out? When we fist started we were playing pretty small clubs and bars in the out-skirts of Fortitude valley and I guess we just got added to better lineups as time moved on! Releasing music definitely helped keep the ball rolling too. I guess just playing together a lot live has helped us progress and now we don’t even really have to think about what we are doing on stage. We can just have fun and make the most of it! 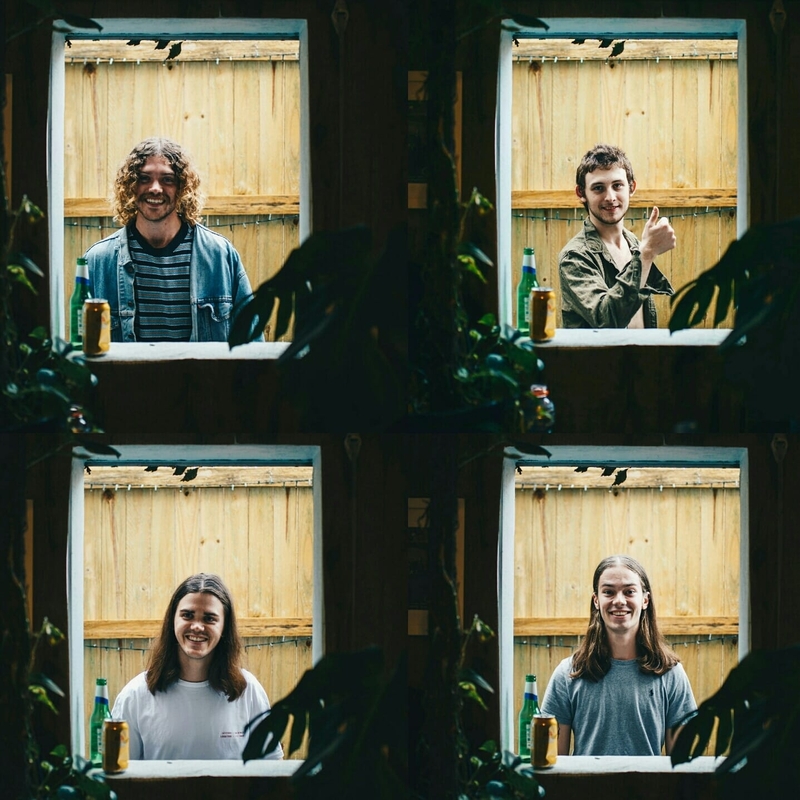 You’ve also featured on awesome lineups; the Bigsound Pre Party and Against the Grain festival with bands City Calm Down, Horror My Friend, Good Boy, Tiny Little Houses and Sweater Curse to name a few! How do your shows usually come about and what do you most enjoy about playing live? Thanks! We are so lucky in Brisbane that everyone knows each other pretty well, so with lineups like Against the Grain it’s pretty much playing with bands we have played with before so it’s super friendly and fun. I think the best part about playing live is being able to look at the four of us on stage and see that we are all just having so much fun and it’s probably the best feeling for me personally. What makes that even better is looking out to the crowd and seeing everyone smiling and singing along with us; It feels pretty good knowing that our music can make so many people happy. I hear that you are currently finalising your 2nd EP for Release in February/March with an accompanying tour, what has influenced the sound and songwriting for the EP? The biggest thing sound wise for this EP is the songs have turned out to be quite a bit heavier both sonically and from a lyrical point of view from our previous releases. I think shedding light on issues like mental illness and politics has been a big focal point of my writing in the past year or so and that can definitely be heard in these songs. We recorded the EP at swan pond studios on a farm in Boonah which is about an hour away from Brisbane. Our friend Ali Richardson engineered the whole thing over 3 days. The best part about being out there was that if things were becoming tense in the Studio we could just take a walk around the paddocks or kick a footy around and I think this helped us produce a better end product. What programs/equipment have you been using throughout the recording process? Um in terms of instrumentation we tried to use as much of the gear we use live so it’s easier to recapture the sound when we play the songs live. Pretty much just fender guitars and amps and a whole bunch of overdrive and fuzz pedals. Trent actually used a Hofner violin bass which was different but really worked within the mix. We recorded using Protools and tried to keep it fairly simple. Your Single Miscommunication just hit 70,000 plays on Spotify 1 year after its release! What do you attribute to the success of this track? Yeah we are all really stoked on that! I think that song has been so successful because it has lyrics that everyone can relate to and combined with a few catchy chord progressions it turned out to be a song that we love playing too. Lately I’ve been getting back into skating which has been really good as a physical outlet and a way of clearing my head, other than that we just like hanging out really hahaha, I sometimes like to shoot film photography when I have the time which is also another good creative outlet. Trent’s pretty passionate about reptiles so he finds himself catching and releasing different lizards in his backyard. Lately I’ve been really digging bands like Shame, Beach Fossils, IDLES, some old hip-hop, and doom bands Conan and Bong-Ripper. Lots and lots of touring next year! Hoping to head down the east coast as much as we can next year and write some more music. My personal favourite food would have to either be pasta, ramen or pizza! And as far as hanging out, our favourite place is the Warehouse where we rehearse and write our music.